Are you familiar with Toon Books? This is the kind of thing Plum and Yellowbelly should be doing. I'm very excited. I am VERY familiar with TOON BOOKS--THEY ARE AWESOME! 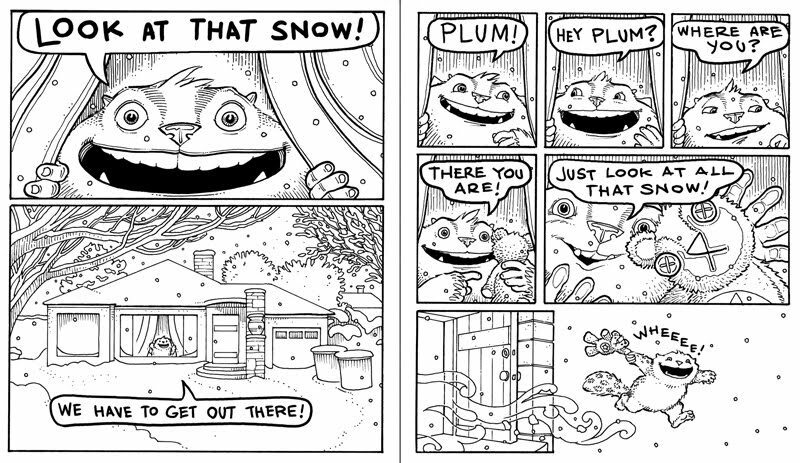 This comic is part of my push for a YB and P early reader book. Maybe TOON will be somewhere they end up. At this point, they are up in the air. We'll see how it goes! REgardless of who is lucky enough to publish it, we need more Yellowbelly and Plum and I have always thought they should be in an early reader series. Doing what you do so well, it is a no brainer to have them be in comic form. Beside remember you heard it right here, right now - Geisl award 2010: Jeff Smith's Little Mouse Gets Dressed. We need more early reader comics. My little guy will read them over and over again--kind of like a girl I know who hates reading, who sat in my chair with Rapunzel's Revenge for two hours. TWO HOURS! This is someone who wanted to know every two minutes if her required 20 minutes was up yet. Yellowbelly and Plum Go To School is my daughter's (18months) and my favorite children's story book! We love the detail and I especially appreciate the humor after reading one hundred boring children's books. I really, really hope that you make more books!